If you’ve always lived in a warm environment, moving to a northern location with a snowy climate can be a culture shock. Dealing with snow during the winter months makes the season feel a lot different to those used to a tropical location, but these months don’t have to mean hiding in the heat of your home. The team of experts at MovingAddresses.org understand the challenges that can come with living in a new and snowy environment. Here are six important tips gathered by these experts to make your transition to a powder-filled winter easier. Get a reliable car – The scariest part of trying to maintain business as usual in the snow is driving your vehicle. Driving on icy and snowy roads is dangerous, especially if you don’t trust your car. When living in a tropical environment, the most important safety feature of your car might have been that the air conditioner works properly. According to the team at MovingAddresses.org, when you move to a snowy environment, you should install tires that are meant for handling the snow and ice. A four-wheel drive vehicle with anti-lock brakes can also make your snowy commute much safer. Buy your snow removal tools ASAP – Even if you move to your new home in the middle of summer, it’s a good idea to buy the tools you’ll need for the winter now. You don’t want to get stuck in your home after an unexpected snow storm with no good shovel to clear the driveway. There can also be a rush to home improvement stores for snow removal tools as soon as the cold weather moves in, making the summer a perfect time to stock up on needed items with plenty of choices. Learn alternative routes into town – When you’re new to a town, it can be hard to find your way around, let alone to learn the backroads. However, the experts at MovingAddresses.org suggest making it your goal to have a few alternative routes to work and the grocery store in your back pocket before the snowy months arrive. This will ensure you can get to the places you need to go if there are some road closures due to snow, ice or accidents. Consider heated floors – If your new home has tile or wood floors, they’re easy to keep clean and a beautiful upgrade from carpet. However, when the bitter-cold months hit your new home, you’ll be surprised how cold these types of flooring can get. Both your pets’ feet and your own feet will experience extreme cold in the snowy months when walking on these types of floors. Installing floor heating can be a helpful way to ensure your feet stay toasty, even when it’s brutally cold outside. The team at MovingAddresses.org recommends shopping for a floor-heating system in the warmer months of the year, when these companies are likely to discount their materials or installation fees. Create an emergency kit – If a blizzard hits your area, you can be stuck inside your home due to road closures. Power outages are also common when a big snowstorm hits the north, so it’s important to be prepared for this. Gather items for an emergency kit now, so you’re ready before getting stuck. When a snowstorm is on the horizon, grocery and home improvement stores can become frenzied and sell out of the essentials you’ll need for a power outage. This emergency kit should contain canned goods and can openers, batteries, flashlights, a battery-powered radio and bottled water. Invest in the right clothing and accessories – If you’re not used to snow, it can be tough to understand the importance of what you wear. Keep in mind that snow is cold and wet, so the experts at MovingAddresses.org remind you that your clothing should not only be warm but also waterproof. Snow boots and gloves are important for keeping your body temperature comfortable, even in the brutal cold. 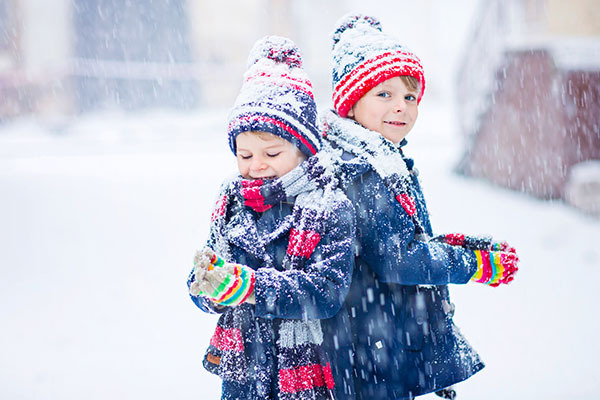 Ear warmers or a hat and an insulated and waterproof coat are also essential if you’re planning to go out in the snow, even for just a few minutes.